30A Vacation Rental Cottage in Grayton Beach with Private Pool + Free Bikes! 30A Escapes Presents... "Casa Sombra"
Nestled in the quaint neighborhood of Grayton Beach, this 4 bedroom home is the perfect getaway. 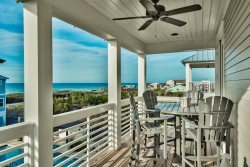 This classic Old Grayton Beach cottage features rich hardwood floors, spacious balconies and a Private Heated Pool. Upon entering the home is the spacious, open concept living, dining and kitchen area. The living area features a comfy sofa, 3 occasional chairs, large flat screen tv and dvd player for entertaining in the evening. The kitchen features stainless steel appliances, a gas Wolf cooktop and a spacious kitchen island that has seating for three. The beautiful wood dining table is perfect for gathering and comfortably seats eight. Just off the living area is a powder room and the first master bedroom. The master bedroom offers a king size bed, flat screen tv, dvd player and French doors leading out to the picturesque backyard. The ensuite bathroom has a single vanity, soak tub and separate shower. Continuing down the hallway, you will come to the inviting backyard. The back porch features a Fireplace with four occasional chairs and a dining table for six for dining alfresco. The gas grill is perfect for preparing fresh seafood! Everyone will love taking a dip in the Private Heated Pool with entertaining fountain or soaking up the sun in one of the loungers. Or if you prefer a little shade after being at the beach, relax in one of the chairs tucked under the vine wrapped pergola that features the 2nd outdoor fireplace. **Live Well 30A provides bonfire amenities, beach chairs, kayaks, paddle boards, grocery delivery, and all of your vacation needs. Upon coming to the 2nd floor, you will find a seating area with a flat screen tv and a fun loft area for a kid to sleep or just take a quick cat nap. The kids' bunk room with 2 bunk beds (total of 4 twins) has a flat screen tv, connected bathroom with a single vanity and shower (this bathroom also connects to the alcove area with the oversized seat) and access to the shared spacious front balcony. The balcony offers a large bed swing and a high top table for six. The queen guest bedroom has a flat screen tv, ensuite bathroom with a single vanity and shower and access to the shared front balcony. The 2nd master bedroom offers a king size bed, flat screen tv, ensuite bathroom with a single vanity, soak tub and separate shower and access to the shared spacious back balcony overlooking the pool. The balcony has four chairs with a coffee table and bench seat. Abbey was just incredible. She responded to every request and made sure we were taking care of. Our family stayed at Casa Sombra and the house was incredible! This house is by far our favorite. We have stayed in various houses for 11 years and Casa Sombra exceeded all expectations.